With the car moving, it's time for a gearbox oil change. Hopefully this will make the gears a little easier too. 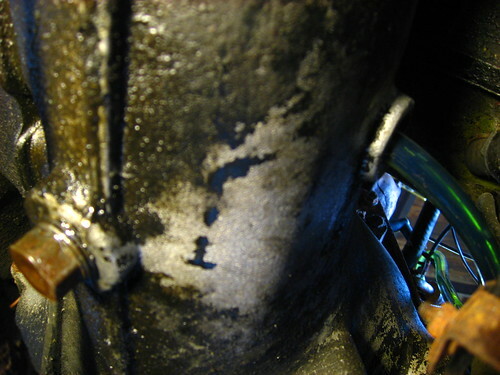 As the gearbox has an overdrive fitted, there are two drain plugs to remove, one on the gearbox itself and one on the overdrive unit (fig 2), behind. The gearbox one came out pretty easily, the OD one taking a little more effort, but they're both the same size (fig 3, OD on left with copper washer). With the later model MGs like this one, the filler plug is on the side of the gearbox, above the drain plug - earlier models have access from the cabin. This filler plug also acts as the fill-level too - you basically fill it until the oil runs out. There are a few ways of getting oil back in the late-model gearbox that I've heard of. One way is to use a squeezy bottle or a syringe-type grease-gun, but as we had some plastic tubing lying around we decided to use that. With the tubing fed through from the engine bay and into the fill hole (fig 1) and a funnel taped to the end we managed to get the 5.5 pints of oil into the gearbox with no mess.